Lighter, shorter, more spacious, and equipped with possibly the best readily-available GPS system possible: the 2015 Honda Fit looks like a lesson in doing a hatchback right. Forget that, it's a lesson on how to do any car right. There were a lot of ways to look at the first Honda Fit. It was a Wagovan for the modern era, it was a mini-minivan, it was a practical car that was fun to drive. The second Honda Fit sort of lost the plot. It was one thing that it got bigger and bloatier, it was another that it lost its joyful feel and its supremely space-efficient cool. This third Fit appears to fix some of the second generation's faults. The 2015 car is wider than the car is replaces, but it's shorter and it rides on a longer wheelbase. Space efficiency is back. There's tons of room in this thing. Here's Automotive News' Mark Rechtin (not a short guy) sitting behind the driver's seat adjusted for himself. He's got plenty of head and leg room, even with a cast on. I came back the next day and squeezed myself into the middle seat next to Alex Kierstien (we're both middle-sized guys) and found that hip room remains a little tight in the back of this Fit, though not awful. Oh, and dropping the rear seats is easy and gives you plenty of space to crawl around, even when you're wearing a suit. This test may have confused some of the Honda reps on hand. Honda also cut the weight of the new car. The structure of the 2015 Fit is 57 pounds lighter than the car it replaces. One representative from Honda US explained that they would probably fill up that weight loss with added features, but still, it's a noble effort from the engineers back in Japan. The front and rear bumpers are different (thanks to different crash tests). We don't get Japan's smallest engine; we start with the 130 horsepower 1.5 liter. The suspension tuning is different. All things considered, that's pretty damn similar. That last change, the one to the ride, is the one question mark over the Fit. Honda claims that the 2015 Fit is more refined than the car it replaces, with a better highway ride and less interior noise. I kinda like my Hondas tinny and darty, so this might be a pain for the enthusiast crowd, but nobody will know until Honda gives out test drives. That said, the average carbuyer seems more interested in mileage than handling, otherwise Alfa Romeo would be the world's biggest manufacturer. 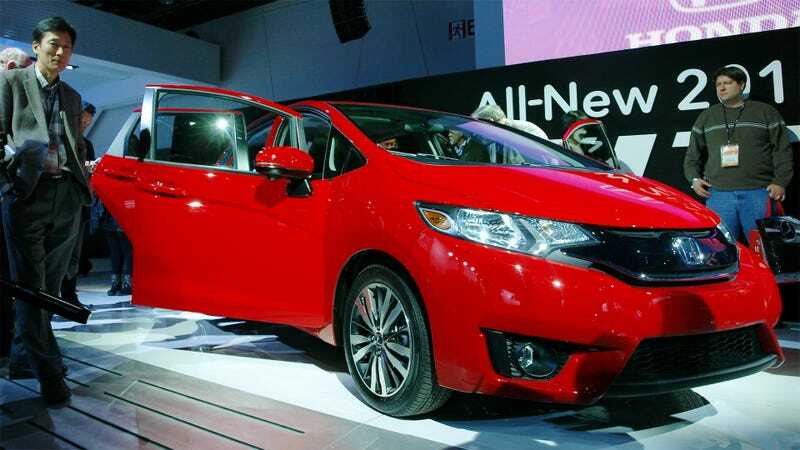 The 2015 Fit with a new CVT is expecting 41 mpg highway and 33 mpg city. Compare that to the old model's 28/35. The last and best feature of the car is Honda's GPS solution: it's your phone. You can order the car with navigation for something around $1500, or you can download the HondaLink app from Honda for $59.99 and get something better. With the app, the car will display your phone's GPS on its seven-inch display. That means as you upgrade your phone, you'll be upgrading your GPS, too. I can't think of a better system. So the 2015 Fit seems like a great effort by Honda, with the only question remaining if it's as fun to drive as the original. I certainly hope it does.